Pongal Quotes, Greeting Messages: Pongal is a tamil festival celebrated in the month of January. It's a harvest festival and folks make sweet rice delicacy and offer to sun god for a bountiful harvest. It's celebrated with great pomp and show in the villages. Farmers are thankful to the sun god for the bountiful harvest and pray for blessings. Families get together conduct competitions for pongal kolams, pongal preparation, breaking sugar canes and so on. Let us enjoy a 'Happy Pongal' and may we have more bountiful harvests. 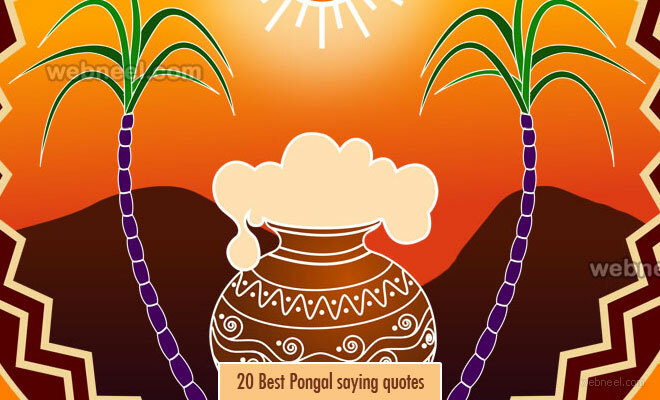 we have added 20 best pongal quotes below. Wishing that this festival brings good luck and prosperity and hoping that it is joyous, and fills your days ahead with happiness. Have a wonderful Pongal. Wishing you the best and prosperous Pongal!